The Chairman of Vinacomin Member Council Le Minh Chuan has signed a decision on assigning duties to the members of Vinacomin Member Council. 1. The Chairman of Vinacomin Member Council- Mr. Le Minh Chuan realizes the rights and responsibilities of the Vinacomin Member Council Chairman as stipulated in the Enterprise Law, the Charter of Vinacomin and the Working Regulations of Vinacomin. To directly steer and supervise the works of: Development strategy and planning, scientific research; balancing resources; developing new business lines; relations with the Party, the State, the National Assembly, the Government, the Fatherland Front, central mass organizations, ministries, central branches, provinces and cities, international and communication organizations; staff organization, internal management regulations; importing and exporting coal, minerals, materials and equipment; be the head of the steering committee for innovation and business development of Vinacomin, head of the board for anti-corruption and anti-waste; and directly steer the Capital Management Board. To exercise the rights and obligations of the General Director as stipulated in the Charter of Vinacomin, the Law on Enterprises, the provisions of the law, the statuses and regulations of Vinacomin. To perform duties of general manager for production and business activities and plans in Vinacomin and its member companies under the resolution and decision of Vinacomin. To be the vice chairman of the steering committee for innovation and enterprise development of Vinacomin. On behalf of the Vinacomin Chairman to direct the activities of Member Council when the Chairman is away for a long time. To preside supervising and managing the following sectors and activities: trade and service’ training, health care, emulation, culture, society, community relations; Manage the capital of Vinacomin in subsidiaries, associate companies in coal production, service and trade. To implement applying CGH – TĐH – THH in the fields and units assigned to preside over management and monitoring. To supervise the implementation of resolutions and decisions of Members Council in training, health care, press, trade, service and water transport services. To direct the Internal Control Board. To preside the prime supervising and managing the following sectors: power generation, mechanical engineering, mine technology, building materials, infrastructure and architectural works and a number of mineral and metallurgical units as assigned. To assist the Chairman in the importing coal, managing the capital of Vinacomin in the units of mineral production, electricity, mechanical engineering, mining chemicals, construction materials and auxiliary units. To implement applying CGH – TĐH – THH in the fields and units assigned to preside over management and monitoring. To supervise implementing the resolutions and decisions of the Member Council in the units: Electricity Corporation, Mining Chemical Industry Corporation, Coal trading companies, Coal import and export joint stock company, Mechanical companies, Joint stock company for transporting and shuttling miners, Overseas projects, Housing and Infrastructure development joint stock company, Project management board for infrastructure and operation building, Lam Dong and Daknong Aluminum Company. To coordinate with Member Council Member Nguyen Van Hai in directing the Internal Control Board. To supervise and manage the following sectors: production of open-cast coal, labor safety and hygiene, environment, consultancy, exploration, geological survey, some of mineral metallurgical units as assigned, infrastructure - and architecture of coal production blocks. To assist the Chairman in overall managing scientific and technological activities. To implement applying CGH – TĐH – THH in the fields and unit assigned to preside over management and monitoring. 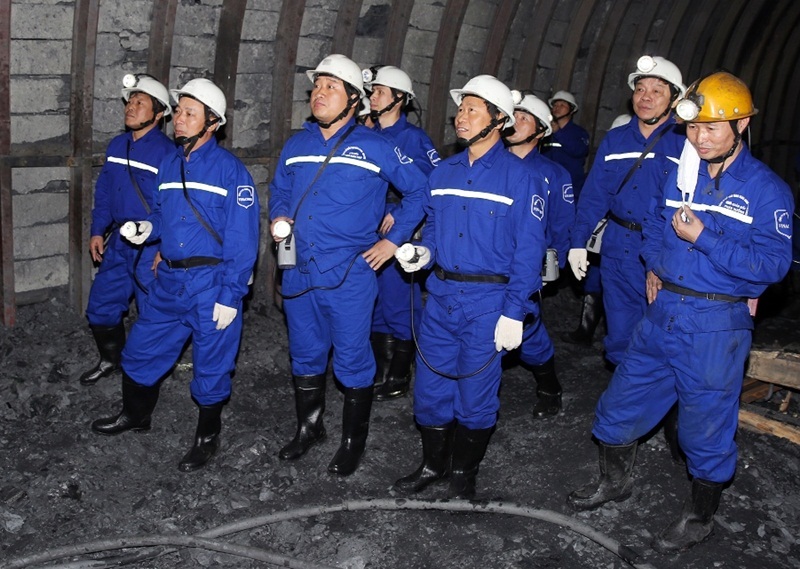 To supervise the implementation of the resolutions and decisions of Vinacomin Member Council in the units producing open-cast coal; Viet Bac mining corporation, Mine emergency aid center; Co Dinh – Thanh Hoa Chromium JSC, Thach Khe iron, Environmental and Construction and Environment companies, Mining and Industrial Investment, Informatics, Technology and Environment, Mining Science and Technology Institute, Mining Energy Engineering Institute, Management board of Hong river coal; Mining geological JSCs, Viet Bac Geological company and the company for Geology and Mineral and hygiene. To supervise and manage the following sectors: underground coal production, pit mining construction, coal sorting and processing, general monitoring mineral processing. To implement applying CGH - TĐH – THH in the fields and unit assigned to preside over management and monitoring. To supervise implementing the resolutions and decisions of the Vinacomin Member Council in the units producing coal mines, mining and construction; inspection units, coal sorting and processing units, warehousing, mineral and metallurgical units (Mineral Corporation, Dong Ta Phut Joint Stock Company); Project Management Board for coal-mining and processing projects; Project Management Consulting Company.